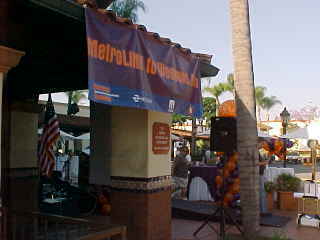 Metrolink announced that it would start weekend Orange County Line service on June 3, 2006. The first train would be in the slot that Surfliner 567 would run if Amtrak had used it. I could never understand why Amtrak does not run Surfliner 562 to San Diego on the weekends. If they had, a person could start their day in the bayside city by 9:00 AM before all the attractions opened. In addition, Surfliner 567 would take the pressure off Surfliner 769. If Amtrak informed passengers of this new Metrolink train, it could do well. Some people had asked me why there was no southbound service in the morning. That would come in July when weekend service would start on the Orange County Inland Empire Line and morning service south of Orange could be utilized. Also in July, we would have Sunday Orange County Line service on the same schedule. I drove to Santa Ana station and as soon as I parked, Chris Parker arrived. We talked at his car before I purchased a Metrolink Special Event ticket from San Juan Capistrano to Los Angeles at 50% off. This fare was good through December 31, 2006 and by buying this ticket allowed Chris to ride for free, which only applied to the second person this particular day. We next walked over to the front of the station where I took pictures of the set-up for the 9:00 kickoff celebration at Santa Ana. After doing that we found Winston Walker and his daughter Christy, then watched Surfliner 763 arrive. Our Surfliner 564 had left Los Angeles twelve minutes late but arrived only nine minutes late. Jim Nowell was waiting at the door and we took three seats of a four seat combination, as well as the two right behind seats on this very crowded train. We stopped at Irvine then slowed for Surfliner 565 before we passed through Mission Viejo. 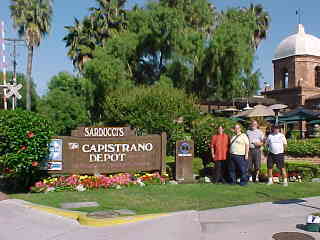 We arrived at San Juan Capistrano where we all detrained. I helped Jim buy his Metrolink ticket before we posed for a group picture. 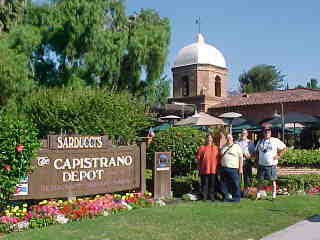 The group photo at San Juan Capistrano. Chris Parker then took a picture so I could be included. 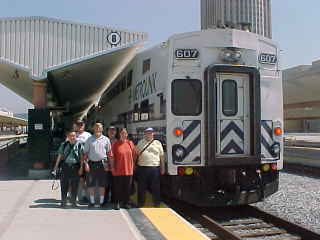 Metrolink 655 pulled into San Juan Capistrano and our group boarded cab car 607 where we found Hideo Noji sitting behind where we sat. He had driven to Oceanside and would ride the whole route of this first run of the new service. The train headed to Laguna Niguel/Mission Viejo where we got a laugh from the single guest welcomer who provided us with a very entertaining show. It was here I found that Andrew, known locally as Mr. BNSF, was also onboard and asked him to join us. A lady thought we had been given T-shirts commemorating the new service, but we corrected her when I handed her my Trainweb.com card, then handed out a few more out in the car. 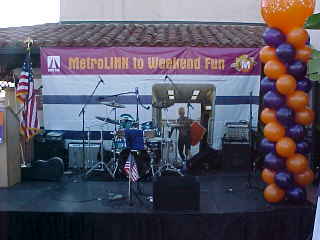 The train stopped at Irvine then made its way to Tustin. At CP Alviso, our train crossed over to Track 2 to be on the station side at Santa Ana. Surfliner 566 went by us before we arrived at Santa Ana where the 9:00 AM kickoff participants would join our train. We made a second stop to load a wheelchair from the center platform. 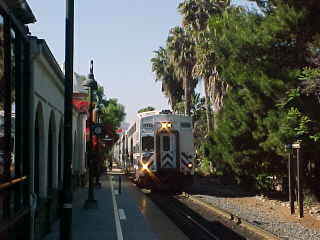 The train next went to Orange, Anaheim and onto Fullerton. 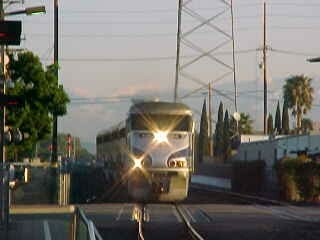 The train then ran by the future Buena Park station then made its way to Norwalk/Santa Fe Springs. As we neared Hobart Yard, the train was slowed by a yellow signal and then a red at Hobart. Once it cleared, we proceeded over the flyover, past the Amtrak yard before arriving at Los Angeles Union Station a few minutes late. After detraining, we set up for a group picture. 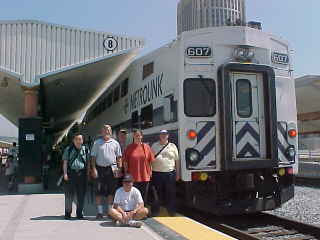 Here is a group photo after our train had arrived into Los Angeles Union Station. Chris Parker again borrowed the camera and took a second photograph so I could be included. At this point, Hideo and Andrew bid us goodbye and the rest of us walked over to the waiting Surfliner 572 which we took home to Santa Ana. Jim got off at Fullerton and the rest of us detrained at Santa Ana, ending a great first trip on Metrolink newest service, Weekend Service on the Orange County Line.